Those blue domes in Santorini, Greece. After renting a 4X4 the morning once arriving in Santorini that became the first mission. Luckily, I woke up at 4pm just before the sunset later that day. It costs 25 Euros to rent the 4×4 per day and I obviously denied the helmet because I wanted to feel the breeze in my silky long hair. Located in the town of Oia (pronounced EE-AH) this is the epic picture I was after before arriving in Greece. What is ironic is that I found it by chance. I was looking for a place to eat with a view of the sea and just as I sat down I saw an army of pictures being taken in my direction. 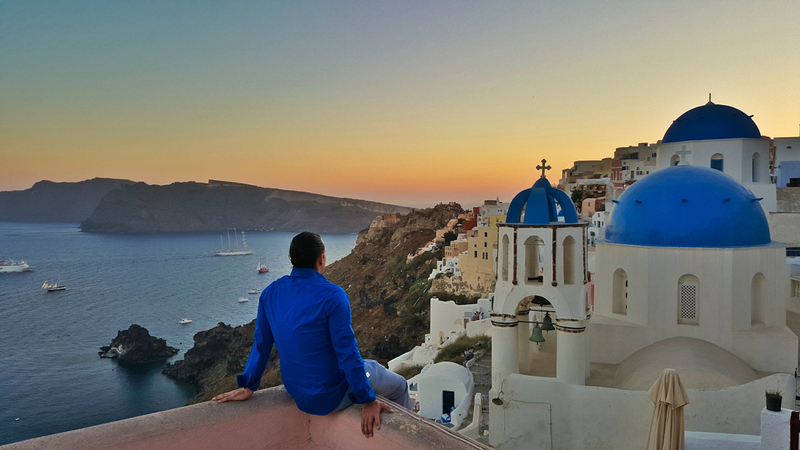 After telling the waiter I would be right back I found the exact spot where everyone takes those iconic pictures of the blue domes in Santorini. Click here for more Greek pictures and read the travel blog for more of the top things to do in Greece! Those blue and the very beautiful sunset give this photo a very dramatic feel.. but I think it would totally be more dramatic if you tone it down a little more.. like pitch black-ish kind of sunset. But this is really lovely. What is 4×4 ? May be risky but the picture is really awesome and the place I could not explain in my word that how beautiful this is. Not risky at all Arifur. I can say that this is a perfect shot. You can see the beauty of the land and the water… and of course, those striking blue domes. What a great place to visit. What a great picture. I see you wore a shirt to match the color of the domes. I enjoyed your post and I think the four wheel drive transportation is a smart tip. Thank you for sharing! Hope you did the gorgeous walk from Fira to Oia. Incredible photo that place is beautiful !!!! You’re my go-to travel blog from now on! I am traveling to Rio in February and then to Egypt, Morocco, Amalfi Coast and Santorini in April- super stoked. Do you remember the name of the restaurant where you took this fab photo? Oia looks like an awesome place to visit – I can’t wait to see it in June. Thanks for the great post! awesome photo ! do you remember how to reach that spot ? ← Next Post Tips for securing discounted travel!